If you guys are coming to Belgrade or Serbia for the first time, the first thing you need to know about our county is that we take our food pretty seriously. Through our history, big empires (Ottoman and Austrian) were settled over here. Geographically Belgrade has really good position, – confluence of two rivers, Danube and Sava. That made a seal on our cuisine. Serbian Food is a mix of different cultures that made our traditional kitchen. If we can choose among all the dishes which is the best, a trademark of Serbia, it would be difficult. But, definitely, Cevapi are among top 10 Serbian foods. If you ask the locals what you should try they will say Cevapcici. You can find them in almost every restaurant in Belgrade, or on every corner – preparing them is easy, and they are also among most popular fast food as well. We are sure that after trying them, you will fall in love. 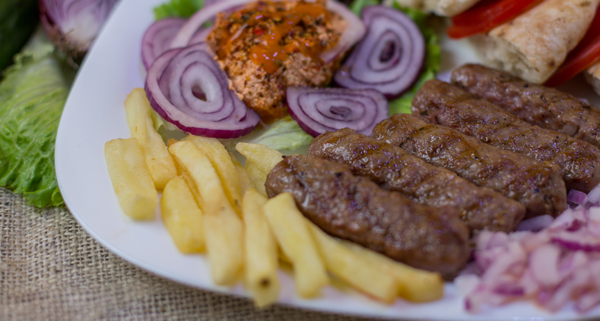 Today we will explain How to make Cevapi/Cevapcici – Recipe is very easy and preparation wont take your precious time. And you will have absolutely new dish to brag about to your friends on dinners! First of all, Cevapi has its origins in the Balkans during the Ottoman period, and represents a regional specialty similar to the Kebab. They are usually served in groups of five to ten pieces on a plate or in a flatbread (lepinje or somun). They are also common in Croatia, Montenegro, Albania, Slovenia, as well as in Republic of Macedonia, Bulgaria and Bosnia and Herzegovina. Cevapi is a grilled dish made of minced meat. Serb Cevapcici are made of either beef, lamb or pork or mixed. For example, in Novi Pazar (City in Serbia, Raska District) common are Cevapcici made of lamb or beef minced meat, and in Leskovac (another city in Serbia which is most popular for their barbecue) most common are Cevapi made of a mix of pork and beef meat. Those 2 types are the most popular in Serbia, and of course, you can find them in Belgrade as well. In a large bowl, combine the ground pork, ground beef, ground lamb and egg white. Firstly, mix the meat with white egg. Than add all the rest of the ingredients: the garlic, salt, baking soda, black pepper, cayenne pepper and paprika. Mix well using your hands. Form into finger length, “fat” sausages about 2.5 cm thick. Arrange them on a plate. Cover with plastic wrap or foil paper and refrigerate for one-hour minimum or even better for 24 hours. This is important to let the flavors settle and the mixture become firm. Lightly oil the grilling surface. Preheat the grill, medium-low heat and than add Cevapi! Grill Cevapcici until they are cooked through, turning as needed. The grilling of Cevapi usually takes about 30 minutes. Serve in warmed or grilled (this is a better solution) flat bread with chopped onions. Ajvar – It is a type of relish, side Serbian dishes which comes with almost every meal perfectly. Represents the perfect combination of red bell peppers, garlic and eggplants. Cottage cheese (Mladi sir) – Serbian cottage cheese is type of cheese with low fat milk, with neutral taste, goes perfectly with this dish! Kajmak- It’s made of unpasteurized and unhomogenized milk – like some type of unripened and “new” cheese. And of course with anything else! 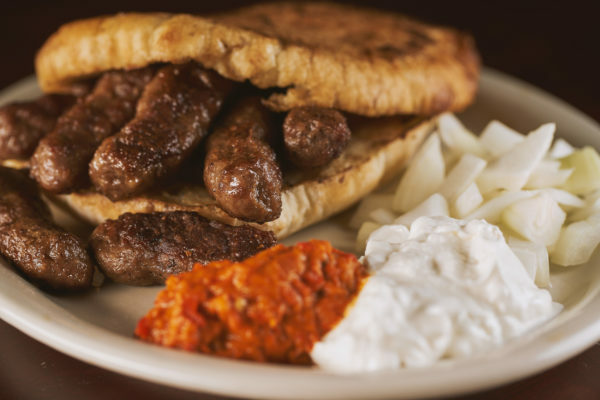 By your opinion, what goes perfectly with Cevapi? Let us know in a comment below!